I love that Summer is making an appearance on the Gold Coast in Spring! I had my first swim of the season last week, although it was more like a freezing cold in and out kind of dip… This summer is going to be one to remember as I lay by the beach with one very huge belly (all worth it while I grow a tiny human inside of me!) 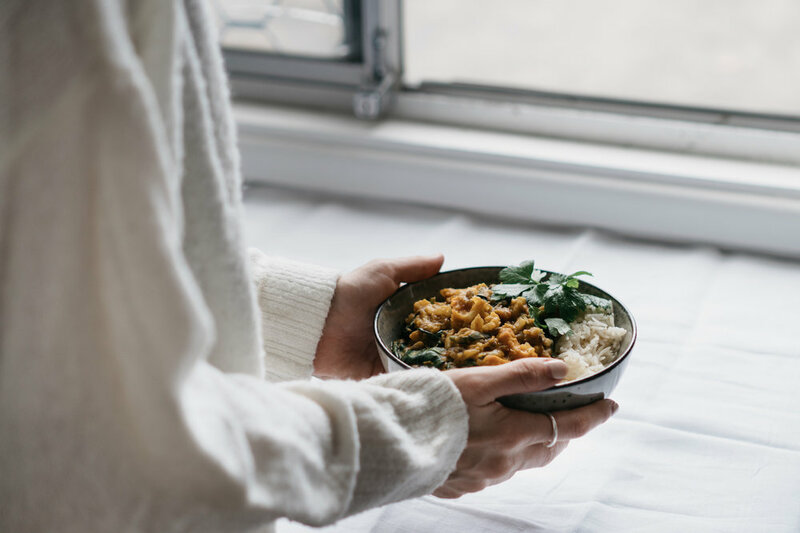 But before we get into the long summer days, salads and smoothies for another year, I’m finishing off the cooler season with this warming vegan curry dish. It’s a great recipe to substitute with whatever vegetables you have left over in the fridge. I made this one on a Friday while cleaning out the fridge crispers to prepare for a new farmers market haul on the weekend. These kind of ‘through it all together’, warming dishes with hearty flavours are my absolute favourite kind of food. I’ll probably continue to make these warming dishes all year around but with this warm weather creeping in, I think it’s time to get the summer salads happening soon! 2. Sauté onion mixture in olive oil over medium heat in a pot with cumin seeds. Add curry powder and turmeric and sauté another 3 minutes. 3. Add crushed tomatoes and pumpkin (or any other hard vegetables you’re using like carrots) and stir to combine flavours. 4. Add in water, stock and lentils and bring to boil. Reduce to a simmer for 25 minutes or until lentils are soft. Serve with quinoa or brown rice and coconut cream and enjoy!